Ask a toddler to count to ten. No problem. Now, ask her to hand over seven grapes. Cardinality or a concrete understanding of the meaning of numbers is a challenging, but important concept for preschoolers. Repetitious counting and sorting of items is an excellent way to encourage them to grasp this concept, but can get tedious and tiresome. 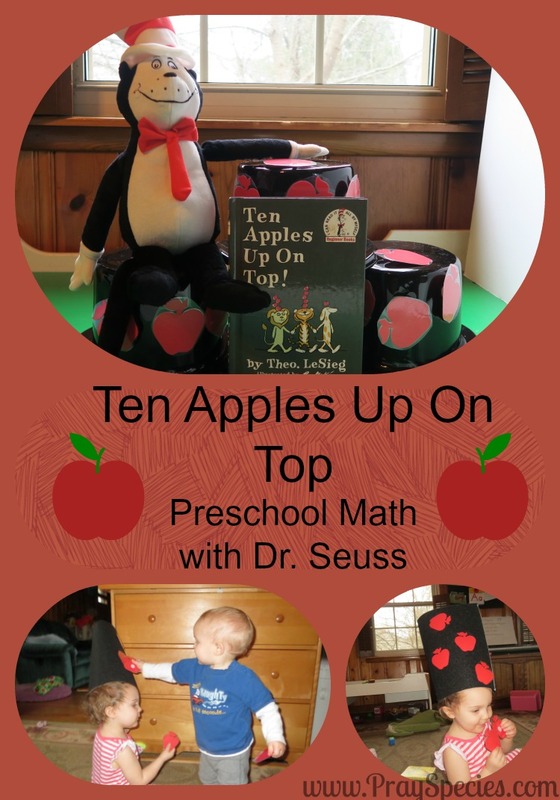 This simple, but oh so fun activity based on Dr. Seuss’s much cherished”Ten Apples Up On Top!” will get kids counting and moving, keeping boredom and disinterest at bay. Learn how many actual items the numbers 1-10 actually represents. 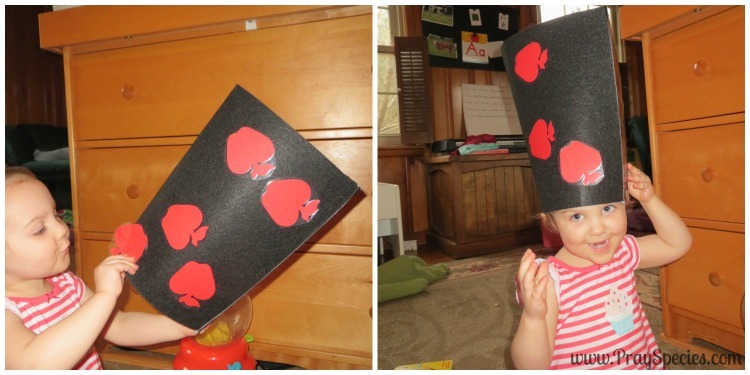 Stick apples “up on top” on a hat the parent or child can wear while reading the book, “Ten Apples Up on Top!” by Dr Seuss. 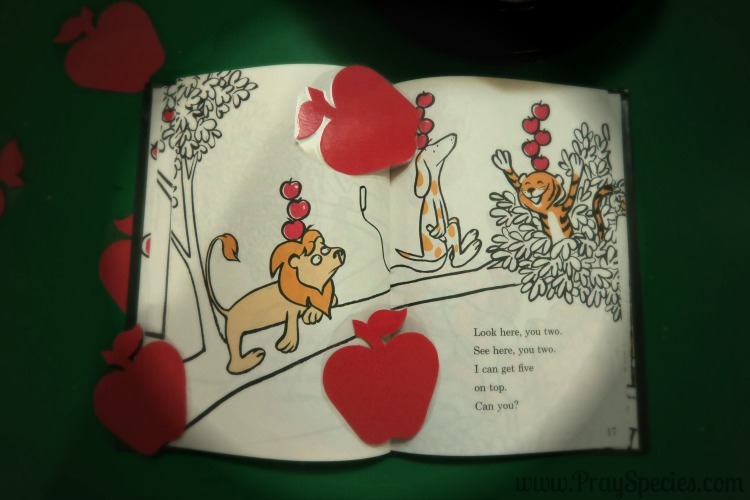 Laminate the apples and characters if desired. Secure a Velcro stick back coin to the back of each laminated apple. Create a felt hat for use with the game. Option 1 Hat: Take some stiffened felt, cut it to the circumference of child’s head and use duck tape to secure it together. This is the option we used last year. Ladybug (@ 2 years old) is modeling the result in the pictures below. 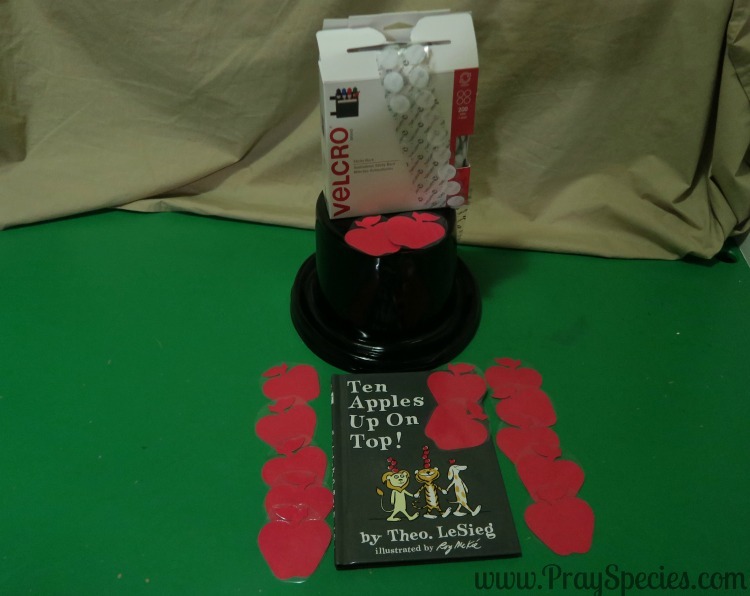 Option 2 Hat: Buy some cheap, plastic top hats from Oriental Trading Company and use Velcro stick back coins to provide a place to secure the apples. This is the option we used this year. Ladybug (@ 3 years old) and Daddy are modeling the result in the pictures below. We’ve played this game in two different ways. Simply read the book and add the apples to the hat as the story dictates. Play this adorable rendition of the story I found on “You Tube” and dance out the activity of the story. Remember counting doesn’t have to happen in a work book or with the same items over and over. Take advantage of time at the grocery store, picking wildflowers, or over breakfast with the grapes in the kid’s oatmeal. Or when you finish playing with your new “Apples Up On Top” activity count the apple slices on your plate as you enjoy a much deserved snack! Just for fun – here are this years selfie outtakes from our family’s “Ten Apples Up on Top” game! 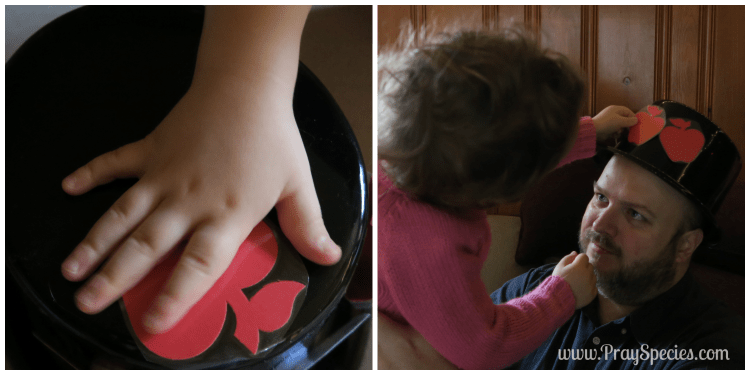 I hope this activity proves to be as much fun for your family as it is for ours! This is one of our favorite books! Your activity looks like so much fun and a great way to introduce counting.